Born in Germany, the home of many of the leading doll artists & manufactures, Nicole Marschollek is the sole artist for Zwergnase dolls. 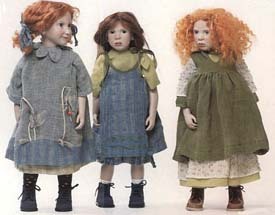 Marschollek dolls are recognised as being amongst the best in the world of modern collectable dolls. Her dolls have gained a well earned reputation for detail & quality with each doll produced. It has often been said that you will always find a part of an artists soul in her work, this has never been more evident than in Nicole Marschollek’s designs. Pictured left are Celest, Ronja & Gun-Magret. Undeniably an artist with great flair, creativeness & individuality, you also catch more than just a mere glimpse of the fun loving, zany personality coming through in her designs. Pictured right is Kunigunde which was the Zwergnases Collectors Club members only doll in 2000. She is 12.7″ tall and was limited to 350 pieces.re Celest, Ronja & Gun-Magret. Her works have been avidly sought after & collected for many years now by doll enthusiasts world wide & many with limitations of only 200 the editions soon sell out. NOTICE – This site is not affiliated or associated in any way with Zwergnase or Nicole Marschollek. The purpose of these pages is to provide information to collectors of Zwergnase Dolls.